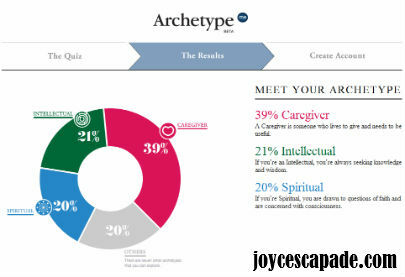 I have taken this quiz by ArchetypeMe. An archetype is a pattern of behavior. It explains who you are and how you engage with the world around you. 39% Caregiver: Lives to give and needs to be useful. 21% Intellectual: Always seeking knowledge and wisdom. 20% Spiritual: Drawn to questions of faith and are concerned with consciousness.